The AR display shows how the building looked in 1890, but with today’s cars and pedestrians. 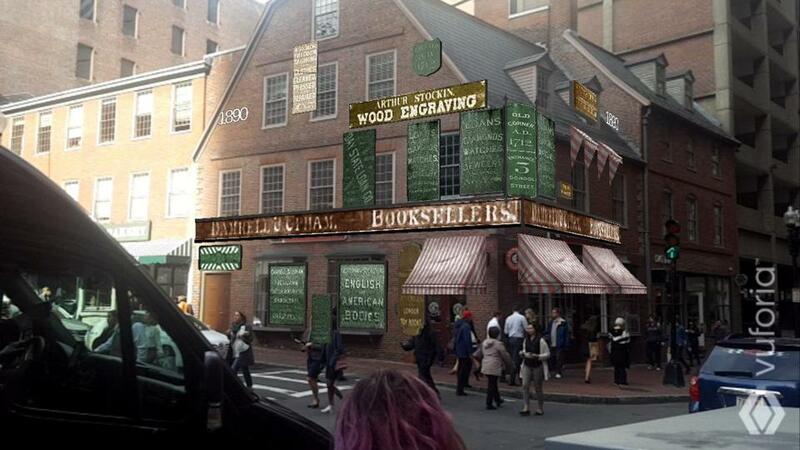 One of Boston’s oldest buildings is getting a makeover in reverse, thanks to “augmented reality,” or AR, a digital technology that will let people see the structure as it looked decades ago. The Old Corner Bookstore, a two-story brick building on the corner of School and Washington streets in downtown Boston, was built in 1718 and now houses a Chipotle Mexican Grill. But it was first a private home with a drugstore on the ground floor. It also served as the headquarters of a famous publishing house, and later became a bookstore, jewelry store, and pizza parlor. From 1998 to 2002, The Boston Globe operated a retail store in the building, stocked with Globe-related books and memorabilia. Now Historic Boston Inc., the nonprofit that saved the Corner Bookstore from demolition in 1960, is celebrating the building’s 300th birthday by letting visitors experience the space in several of its past incarnations by scanning it with their smartphones. An AR system displays digital images on top of the real world. The most familiar example is the yellow first-down line projected onto the field during televised football games. But AR can show far more complex images, and it works on standard smartphones. Apple Inc. recently added AR software to its iPhone, allowing software developers to design video games in which the action appears to be taking place in the player’s own living room. For this project, artists Ethan Vogt and Giovanna Casimiro reproduced the signs and displays that would have decorated the Corner Bookstore in 1850, 1890, 1960, and 1990. Next, software developers combined these images with an AR program that was developed by PTC Corp. of Needham. When the user launches an AR viewing app and aims a smartphone at the building, the artists’ images replace the modern signage. The building takes on the look of a bygone era, even though it’s still surrounded by today’s cars, trucks, and pedestrians. The building’s most prestigious era came in the mid-19th century, when it served as the headquarters of Ticknor and Fields, once one of America’s most respected publishing houses. The company published a host of the nation’s leading writers, including Nathaniel Hawthorne, Harriet Beecher Stowe, Henry Wadsworth Longfellow, and Ralph Waldo Emerson. By 1890, the site housed a bookstore and a jewelry store, as well as a woodworking shop and a tailor. By 1960, it was offering “sliced crispy pizza,” and its elegant roof was partly obscured by a huge, gaudy sign advertising the Boston Five Cents Savings Bank. Fast-forward to 1990, and the building had become the Globe Corner Bookstore, specializing in the sale of travel books and paper maps of the sort that few people use in the age of Google. Each of these incarnations is made visible through the AR display. Historic Boston volunteers were on hand over the weekend to let visitors see the images through specially programmed tablet computers. It was part of Illuminus, a nighttime arts festival centered in Downtown Crossing. Kottaridis said that by Thanksgiving, her organization plans to release free apps to let people with Android and Apple devices see the images whenever they want. Kottaridis also said that the AR displays will remain available indefinitely.